I finished my home decor project in the living room this week. For those who missed my last post, I ran into a bit of an obstacle while implementing my most recent project. 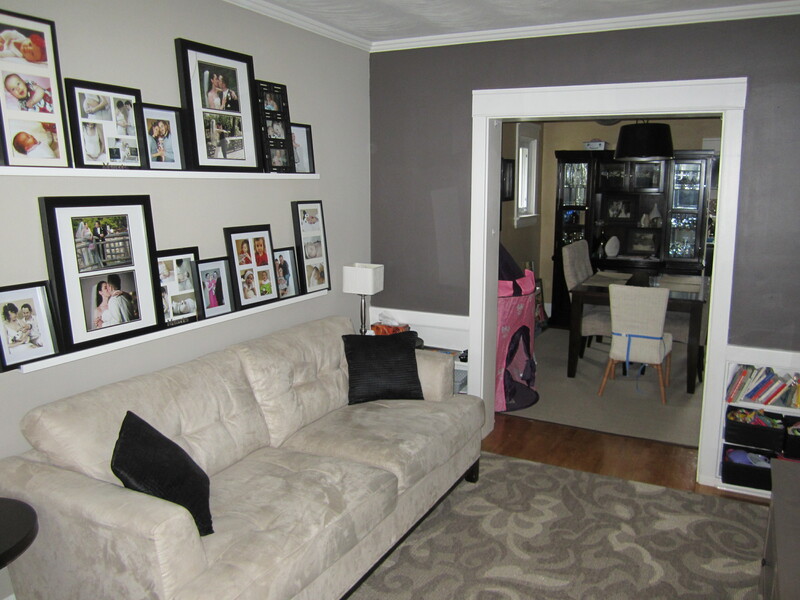 My plan was to paint a feature wall and then hang picture ledges to display family photos. Due to a structural issue, I was unable to use screws to install the picture ledges. Hmmm. After patching the holes, I left the wall bare while I problem solved this issue. After a few days, I decided to leave the wall plain. 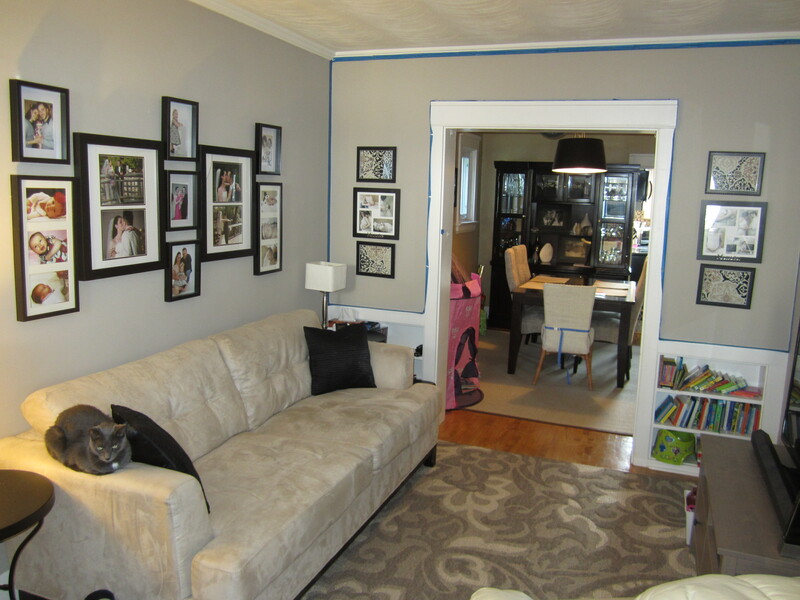 Because I also installed picture ledges on the adjacent wall above the couch, I wasn’t concerned about the space looking too bland. I tried to display my family photos in a gallery-like fashion but it didn’t work out the way I was hoping. It was way too difficult to try and get the spacing perfect for all the frames. I love the colour of paint I choose. It is a brown-based grey so it goes perfectly with the beige on the other walls. It also matches really well with the rug. The picture ledges are so functional and make displaying photos really easy. I don’t need to nail new holes every time I want to move things around or add new frames. I also did some de-cluttering with the girls’ toys and books so everything is much more organized. I love baskets for clutter. All the mess is still there but because it is contained, it looks so much cleaner. It also helps my toddler when cleaning up because everything has a home and she knows where everything belongs. I love it so much. The colour is great, and with the ledges, you can change up the frames and pics so easily. Thanks! I am forever switching up my pictures so this makes it so much easier! And yes, that is our princess castle. L loves it! Love this look! I REALLY love the picture ledges and have been trying to find some. Where did you get them???? Thanks! The ledges are from Ikea but they are a few years old. They still sell them but not in this size.